On Saturday whilst visiting my elder son, my wife and I popped into Liverpool Metropolitan Cathedral. 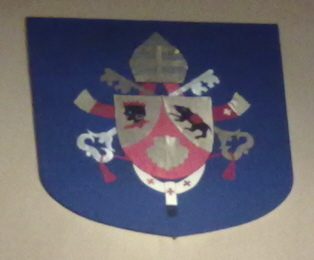 On display there are the Arms of Pope Benedict XVI. (I had not banked on HH the Pope becoming so newsworthy.) Regrettably, I was only armed with my camera phone and as such my picture is not as good as I would wish. Gules chape ployé Or with the scallop shell Or the dexter chape with a moor’s head Proper crowned and collared Gules the sinister chape a bear trippant Proper carrying a pack Gules belted Sable.